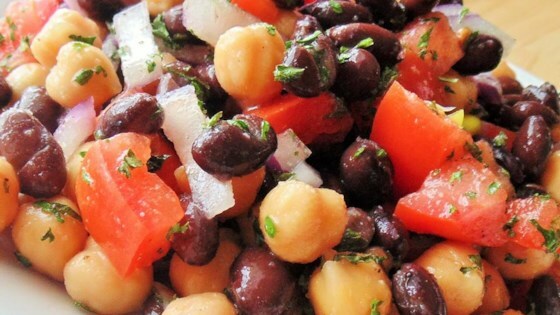 "Middle Eastern chickpea and black bean salad flavored with fresh herbs. Super simple and refreshing!" Stir chickpeas, black beans, tomatoes, red onion, parsley, and mint together in a large bowl. Whisk lemon juice, olive oil, garlic, cumin, salt, and ground pepper together in a bowl; pour over chickpea mixture and toss to coat. Cover and refrigerate salad until flavors blend, about 30 minutes. Really good! I added some extra things that we like-green peppers, black olives and toasted couscous. Also added a bit more lemon juice. Really easy, healthy and refreshing.